From suing downloaders to larcenous ticket prices, there’s little good coming from the music business these days. Last week, an industry lawyer even stated, under oath, that he believed copying a CD for personal use is theft. The only hits anyone wishes for this gang are the “Sopranos” kind. This resentment didn’t begin with MP3s (with fans, perhaps). Musicians have long stoked the flames; in 1970, this rage produced one of rock’s great works. 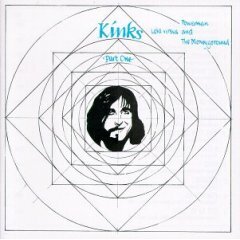 “Lola versus Powerman and the Moneygoround” arrived after a few fallow years for the Kinks. People that bandleader Ray Davies called “pinstripe minds” were bleeding them dry. The iTunes generation probably won’t look past the record’s biggest hit, “Lola.” But this was a time when the word “album” meant something – a cohesive work, not three minutes of pleasure surrounded by fluff. That’s the difference between a quickie and a serious relationship, and it’s probably why so much classic rock still resonates today. Rock alchemy ensues. “My record’s up to number three … this all seems like a crazy dream,” sings Davies in “Top of the Pops” – then it hits number one. “This means you can earn some real money,” his agent promises. “Do they all deserve money from a song that they’ve never heard?” he asks. Well, no – but that’s the nature of the beast. “I’ve gotta be free,” Davies sings on the last track of the last album the Kinks would make for Reprise (interestingly, one of the few unavailable online). Thursday: Imani Winds, Hopkins Center – This youthful group of New Yorkers – four women, one man – take the notion of a wind quintet out of the chamber and into the street. They take their name from the Swahili word for “faith,” and blend elements of classical with jazz, Latin and African rhythms. It’s more Marsalis than Mozart, and a lot of fun. Friday: Chris O’Brien, Boccelli’s – As a music fan, I live for those moments when I hear a performer for the first time and detect unmistakable magic. It happened with Shawn Colvin in 1989 and Patty Griffin in 1996. Last summer, O’Brien caught my ear – he’s an uncommonly talented lyricist, with a voice that feels comfortable and familiar at first listen. If you only have time for one show this weekend, this is it. Saturday: Paingivers’ Ball, Hit or Miss Lodge – Rick’s Tattoo in Newport is celebrating two years in business with a four-band show in Springfield, benefiting local charities. It features Soul Octane Burner, a Unity metal band with bullhorn vocals and Steve Vai-worthy guitar shredding, perennial favorites Roadhouse, Fall Line and Eyesore. Most importantly, it’s a costume ball, though with enough body ink and piercing, every day can be Halloween. Sunday: Peter Mulvey & Antje Duvekot, Iron Horse – Independent folk doesn’t get much better than this. Mulvey’s a cult favorite, with several albums of finely honed music under his belt (including a turn with the supergroup Redbird). Duvekot – well, she’s bound for glory, with topical songs like “Judas” and “Jerusalem,” and an angelic voice to match her soul-tugging lyrics. Monday: Eco-Tones, Colby-Sawyer College – Pete Townshend once urged listeners to “dance while your knowledge is growing” and this duo, who also perform as Sferes & White, take that advice to heart. They combine original music, influenced by Jackson Browne, Bonnie Raitt and others, with lessons in planet-friendliness. Naturally, they drive to their gigs in a biodiesel bus. Tuesday: Irish Sessions, Salt Hill Pub – Blues Night, a Thursday Pub mainstay for the summer, is on hiatus, but the musical circle in the center of the room continues. Chris Stevens, Roger Burridge and Dave Loney and friends concoct a stew of inspiration that’s never the same week to week.